Objectives : 2x4x or 3x, 5x, 45x, 10x, 100x. Eyepiece : 10x, 15x wide field (Paired) total head rotatable 0-360° and also removable from the body, built-in transformer and solid state intensity control system within the base, complete in wooden box. Camera Lucida (prism type)- This can fit eye piece tube of any microscope, in velvet-lined case. Camera Lucida (mirror type)- A large mirror with adjustable inclination and its arm is extensible. This can fit eye piece tube of any microscope in a velvet-lined case. Double Demonstration Eye Piece- A useful instrument for every biological laboratory. It is convenient for simultaneous viewing by the student and the instructor. The smooth movement of the pointer is covering the entire field, in velvet lined case. Microscope Lamp- This lamp can be fixed under the stage of microscope in place of reflector. Supplied with filter, bulb, cord and plug. Workable on 230 volts AC/DC. 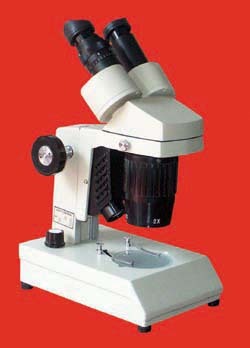 Microscope Lamp- Lamp is fitted on heavy metal base. Lamp is finished in beautiful colour Supplied wit h condenser, adjustable iris diaphragm, bulb and two filters, workable on 220 volts AC/DC. Microscope Lamp- Same as above but with variable light control transformer for high intensity of light. on 220 volts A.C. Microscope optics set, consisting of 2 objectives 10x and 45x and 2 eye pieces 10x and 15x total magnification 675x. Pointer eye Pieces - 10x or 15x in velvet lined box.